The government is taking the Public Servants Association (PSA) to the Labour Court over strike at SA Social Security Agency (Sassa) offices, but the PSA intends to oppose it, a spokesperson said on Monday. "They are oblivious that the poor are going to suffer," the PSA's Tahir Maepa told News24 on Monday. He said the association had hoped to resolve the pay dispute. Instead, it received court papers on Monday to say that the Department of Social Development would apply for an interdict to stop the strike. It is expected to be heard in the Labour Court in Johannesburg on Tuesday. Social development spokesperson Paseka Letsatsi told News24 that the department filed the court interdict earlier on Monday. "People know when they want to go on strike; there [are] certain procedures that they need to follow. "You just don't wake up and decide that you want to go on strike. They know the rules of the game if they want to go on strike." Maepa said the PSA had given the department since June to respond to members' demands, and was surprised that it was being taken to court. The strike action comes after the PSA and Sassa could not agree on pay increases. The PSA tabled its demand on February 1 at the Sassa National Bargaining Forum, requiring a single-term agreement with a general sliding-scale salary increase of between 13% and 15%. The union also wants issues related to housing, leave, post establishment, danger allowances, performance management, and the insourcing of certain services, to be discussed. 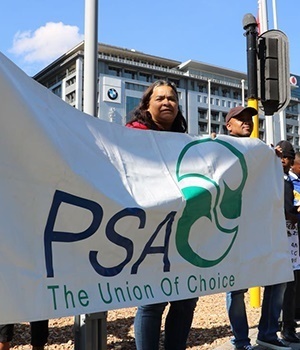 The PSA's negotiations appear to have been complicated by unions affiliated to the Congress of SA Trade Unions accepting and signing pay offers.